In this IE Blog post article, I discuss how the W3C Web Performance APIS are rapidly becoming W3C Recommendations with interoperable support for all major web browsers. The W3C Web Performance Working Group recently published three specifications as W3C Recommendations with full implementations from all major browser vendors, advancing developers’ ability to accurately measure the performance of Web applications and make the Web faster. Over the last three years, companies including Microsoft, Google, Mozilla, Intel, Facebook, and others have been working towards standardizing the Navigation Timing, High Resolution Time, and Page Visibility interfaces in the Working Group. Rapid adoption of these recommendations demonstrates what’s possible when the industry and community come together through the W3C. To make the Web faster, developers need the ability to accurately measure the performance characteristics of Web applications and the ability to effectively use the underlying hardware to improve the performance of their applications. To solve these problems, the Web Performance Working Group worked on 15 different specifications that address those issues. 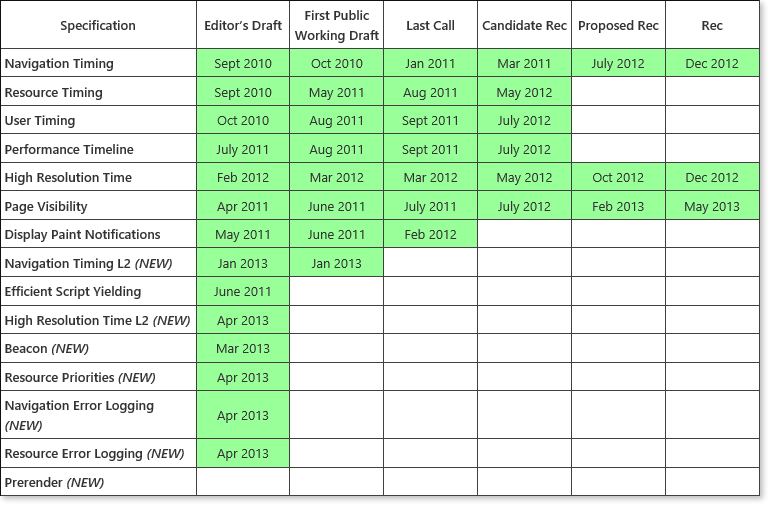 The table below shows the maturity level of all the specifications currently edited by the Working Group. 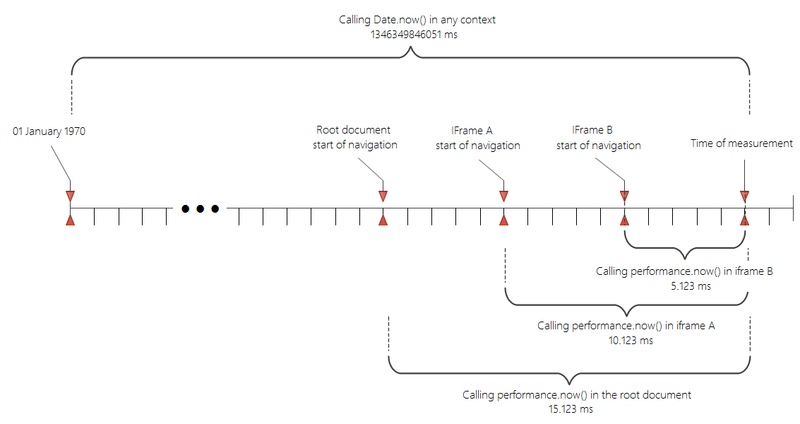 The Navigation Timing, Resource Timing, User Timing, and Performance Timeline specifications help developers accurately measure the timing of the navigation of the document, fetching of resources on the page, and developer script execution. Prior to these APIs, this data wasn’t easily obtainable. Navigation Timing was published as a W3C Recommendation, and all major browser vendors support it. The other three interfaces are currently at the Candidate Recommendation stage awaiting two full implementations from browser vendors. IE10 is currently the only browser that implements all of these interfaces, however, other vendors are working on implementations. To ensure these performance metrics are measured in the most accurate way possible, the High Resolution Time specification allows developers to measure operations with sub-millisecond accuracy. This interface not only benefits accurate measurements of performance metrics, but also allows better frame rate calculations and synchronization of animations or audio cues. This interface has been published as a W3C Recommendation, with all major browser vendors implementing the performance.now() method defined in the specification. The Page Visibility API allows for programmatically determining the current visibility state of the page. Developers can use this data to make better CPU- and power-efficiency decisions, e.g., throttling down activity when the page is in the background tab. This specification has also been published as a W3C Recommendation, with all major browser vendors implementing it. This year the Working Group also started to look at new ideas, with editor’s drafts of those ideas currently being discussed in the Working Group. The Beacon API is intended to help scripts asynchronously transfer data to a Web server without blocking the unload event, which can negatively impact the perceived performance of the next navigation. The Resource Priorities API defines a means for Web developers to give the browser hints on the download priority of resources to help improve the page load time. As a corollary to the Timing specs, the Navigation Error Logging and Resource Error Loggingspecifications help developers understand the errors and availability of their applications. The Navigation Timing Level L2 specification adds High Resolution Time and Performance Timeline support to Navigation Timing, and High Resolution Time L2 specification adds Web Worker support. These are just some of the drafts the Working Group is currently defining, with more specification drafts on Prerender and other diagnostics areas forthcoming. The W3C Web Performance Working Group is a great example of how quickly new ideas can become interoperable standards that developers can depend on in modern HTML5-enabled browsers. Together with industry and community leaders who participate in the Working Group, we hope to continue to make rapid progress on interoperable standards that will help developers make the Web faster. Sometimes measuring time in millisecond resolution just isn’t accurate enough. Together with industry and community leaders, the W3C Web Performance working group has worked to solve this problem by standardizing the High Resolution Time specification. As of this week, this specification has been published as a Proposed Recommendation (PR) and is widely adopted in modern browsers. Take a look at the What Time is it? test drive demo to see how this API works. This specification has gone from just an idea to PR in eight short months. The PR stage of standardization is the final step before a Web standard becomes an official W3C Recommendation. Additionally, this interface has been broadly adopted in browsers, including full support in Internet Explorer 10 and Firefox 15, and supported with a prefix in Chrome 22. This is a great example of what’s possible when the industry and community come together through the W3C. For example, at the time of writing this blog, my Date.now() time value from my IE10 Developer Tools Console was 1350509874902. This thirteen digit number represents the number of milliseconds from the origin of this time base, 01 January, 1970. That time corresponds to 17 Oct 2012 21:37:54 UTC. Though this definition will continue to be genuinely useful for determining the current calendar time, there are some cases where this definition is not sufficient. For example, it is useful for developers to determine if their animation is running smoothly at 60 frames per second (one frame painted every 16.667 milliseconds). Using the simple method of calculating the instantaneous FPS by measuring when the frame drawing callback was last made, one can only determine FPS to 58.8 FPS (1/17) or 62.5 FPS (1/16). Similarly, sub-millisecond resolution is also desirable when accurately measuring elapsed time (e.g., using the Navigation Timing, Resource Timing and User Timing APIs to instrument your network and script timing) or when attempting to synchronize animation scenes or audio with animation. To solve this issue, the High Resolution Time specification defines a new time base with at least microsecond resolution (one thousandth of a millisecond). To reduce the number of bits used to represent this number and to increase readability, instead of measuring time from 01 January, 1970 UTC, this new time base measures time from the beginning of navigation of the document, performance.timing.navigationStart. The specification defines performance.now() as the analogous method to Date.now() for determining the current time in high resolution. The DOMHighResTimeStamp is the analogous type to DOMTimeStamp that defines the high resolution time value. Even though both of these time values represent the same instance in time, they are being measured from a different origin. The performance.now() time value definitely feels more readable. This design not only ensures there is no data leakage on the time of creation of the parent in cross-origin iframes, it also allows you to measure time relative to your start. For example, if you were using the Resource Timing interface (which uses High Resolution Time) to determine how long it takes for a server to respond to a resource request in a sub-document, you wouldn’t need to make adjustments to take the time of adding the sub-document to the root document into account. If you wish to do cross frame time comparisons, you would just need to request top.performance.now() to get a time value relative to the root document’s start of navigation, which would return the same value in all same-origin iframes. Another significant benefit of this API over Date.now() is that performance.now() is monotonically increasing and not subject to clock skew or adjustment. The difference between subsequent calls to performance.now() will never be negative. Date.now() doesn’t have such a guarantee and in practice we have heard of reported cases where negatives time have been seen in analytics data. High Resolution Time is another great example of how quickly new ideas can become interoperable standards that developers can depend on in modern HTML5-enabled browsers. Thanks to everyone in the W3C Web Performance Working Group for helping design this API and to other browser vendors for rapidly implementing it with an eye towards interoperability.